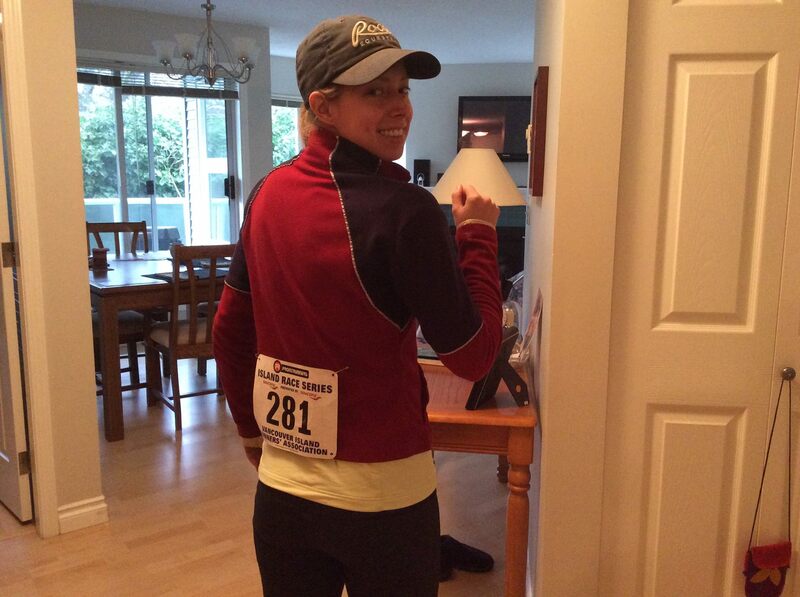 Hatley Castle 8k- Race Recap! This past Sunday was the Hatley Castle 8k- a fun and challenging race in the VIRA Island Race Series. Notable for a very hilly course, scenic views, and tasty hotdogs for the participants! It was also freezing. There was a light dusting of snow on the ground, and the gravel was slick and icy. A windstorm was currently raging in Victoria, luckily we only got hit with it at Royal Roads when we ran along the water at the start. Anyways, it felt pretty lousy. I didn’t have very high hopes for the race- not that this was bumming me out, but that I’m focusing more on building more Km’s into my week and not taking a lot of time off during the week= deader legs. I know this going in, so I am not using these races for goal races, I’m realistic about what I can accomplish. But…I’m also improving. I am getting faster, even with not-so-fresh legs supporting me. Run with your jacket flapping like Superwoman. Yeah that’s not annoying at all! Watch doesn’t start. Notice 1km in. It is so cold my exercise asthma was kind of flaring but not badly so. We ran up the first hill, I was getting passed like crazy but I had a feeling like- nah, I can do this. I will wait. I will bide my time and then I will go. To be honest this ‘zen’ mindset is more to keep me from freaking out and trying to run faster when I am getting passed early. That’s a quick way for me to ruin a race. I have to run MY race. So I hung on, lost a bit of speed and enthusiasm up the longer hill and we hit the flatter gravel section. Now it’s flat but also gravel….slippy. The guy running ahead of me slid pretty dramatically around the turnaround but he didn’t fall! Came damn close though. I plugged along, not running great but kind of looking forward to the forested trail section. We ran for awhile on the gravel and then turned into the woods. Yes! My time to shine! (sort of). I was able to tackle the hills well here, played leapfrog with another woman runner up to the top of the hill. By then, I was able to pass her and stay past. I had been getting passed by her consistently up until then. Sweet!! Then the loooong downhill. Ouch my hamstrings. Flat section, some more gravel, and a slight downill again. Use it! Free speed. But I am happy with my time: 36:39 and good enough for 1st in my AG women’s 30-34. First time ever! (also for context: This time last year would have netted me 6th place. Ha). Thanks again for the volunteers, race directors and VIRA for putting on a well-run, smoothly executed race despite some weather challenges! First off, thanks to the volunteers and race organizers. This is a VERY smoothly run race, and I absolutely loved the post-race food options (great soup, hot dogs! pizza?! wow!!). A super effort by all involved and made my recovery that much more fun. 7th place!! Photo is courtesy of the Prairie Inn Harriers. Now for the race recap: Wow, this was a lot harder than I felt it should have been, and it was 100% my fault- I went out FAST in the beginning (first downhill km at 3:55? No way can I run that fast, and I was just getting caught up and silly). It was then a strugglefest for the rest of the race, thanks to my poor planning. Basically my race was a textbook example of poor pacing efforts, combined with another perfect positive split. So, don’t do what I did- ha. I honestly felt like I would have paid someone to let me quit midway through, it felt that rough. Well deserved (until I fell off Oats shortly after). I wanted to puke, pass out and collapse. I had the distinct pleasure of getting passed right left and centre all throughout the race, which made it tough to ‘run my race’ instead of feeling like I was getting caught up and passed constantly. The ‘hurry scurry’ feeling just never left and I couldn’t achieve that ‘flow’ that I try to during races. Maybe it’s because I’m out of practice for taking a few months off racing, and the 8k, while a fine distance, is just not my distance. It was a very chilly day and it actually started snowing like crazy when we finished. Thank god we missed that though- a stroke of good luck. I was happy with my time (36:06 net, 36:11 gun time) which is a slight improvement from last year (36:20), but I do still feel like if I ran a better, more competent race I would have fared wayyyy better. hahah. At the finish, I wasn’t sprinting, I was struggling. I was huffing and puffing and trying to catch my breath, reeling and staggering at the end. I sat down on a retaining wall and felt dizzy. Yuck! I was coughing heavily for the rest of the day, thanks to my incompetent lungs being slightly damaged- yuck again. With my time I received 7th place AG, which is fine for a fairly competitive race. And after the run, my husband and I enjoyed a very nice beer taster at Category 12, which is nearby, and then we headed to the barn so I could get a quick ride in on Oats. He spooked during my ride, and I promptly tumbled off. Not my day I guess? I was fine, landed on my feet and hopped back on and continued but yeeesh, I guess I was just tired, and not ‘with it’ haha. Oh well, a lesson to learn for that day. I am stiff as heck today though! As part of the 7-run series, Vancouver Island Race Series offered the first race of the season, the Prairie Inn Harriesr 36th annual 8k! We ran this race last year as our first race ever, trying out the series. Before that, I had only run Times Colonist 10ks (twice). Last year I was impressed! It’s a fairly big race for a ‘small’ local race- between 500 and 600 runners, enough to make it feel fairly competitive and a very fast, international field. I didn’t really train as much last year, and this year I was feeling maybe a bit cocky? I had set some very aggressive time goals- 35 minutes (well, like under 36 more likely). And did I meet my ambitious time goals? a big NOPE on that! I did run home to a fairly decent 36:20 (gun) and 36:12 (net), which is certainly nothing to cry about. I feel good that I left everything on the course. I was dying! We held a quick pace of avg. 4:31 (well my race time online said I ran at 4:32 but my watch said 4:31) but it was very fast for me. And honesty time here: I do not practice race pace. I absolutely dislike speedwork and would rather even run hills…And it showed. My breathing sucked out loud. I was immediately struggling to breathe. I was gasping, my mouth was like, hanging open the whole time and I was coughing and choking on phlegm the whole run. It felt like torture! This really nasty breathing was kind of an eye opener for me. If I had taken it down a notch, I’m sure the really loud, horrible gasping breaths I was taking would diminish and I would be able to ‘catch’ my breath again. But…I wanted to keep at my 4:30-ish pace. Wanted to, wanted to, wanted to. I had to prove something to myself. So I did, and mannnnnn it was rough. I was running at maximum anaerobic capacity for me. And it showed. I had zero sprint near the end, my lungs physically hurt, my throat hurt and my neck hurt? Funny enough, my legs felt fine?!! At the end, I recovered fine. The course was well marked, quite busy at first – and that is where I lost quite a few seconds between gun/chip time – lesson learned about getting close to the start line…And the volunteers were great, cheerful and lots of encouraging words~! The food was great- I had orange slices, pb&J sandwiches, hummus and pita/veggies, and great cookies. They had the protein milk shakes I like best (Milk 2 Go) and yogurt too! Pretty ribbon! A big thanks to the Harriers for mailing it to me. And the funniest thing? I even placed in my age division- 7th!! Woo! That was a surprise, and we left before they gave out awards, thinking we were total no-hopers. Well shoot, I should have stayed after all! 🙂 And thanks to my husband for slowing down enough to keep me on track. It was painful but worth it. As I mentioned yesterday, Oats and I were supposed to have an adventure this past weekend that didn’t pan out (fortunately!) but it’s awakened my thirst for more. Now I’m scanning the horse boards online looking for horse shows or clinics or anything cool to do with Oats. Yes, I’m getting- bored- ?? Or just antsy to go and DO something at this point?! Part of me is like, whoaa, hang on. You have 3 races coming up on back-to-back weekends in a row. Wait and see what your energy is like from those and then get back to me about wanting to spend the $$$ and time getting your horse out to places and events. The other part is like, hells yes I want to go take Oats places! $$$ and time be damned! I also happen to have a bad track record of over-scheduling myself and running myself ragged physically (no joke, I actually got ‘exhaustion’ this fall?). First race (Harriers 8k) is this weekend. After that, we shall see! I also have a dressage lesson tonight, and my flat rides lately have been very frustrating. Not scary, just frustrating. Makes me want to strangle my pony, who I know is only trying his best. So….yeah. Should be interesting. Well, more like running a race that is! Ran my first Island Series race yesterday and it went REALLY well. I didn’t have the highest hopes as I’ve never run an 8k before, only 10ks, and I wasn’t sure how my knee would hold up, or how I’d go (haven’t been training that much since I got back over Christmas) but as it turns out, I was quite pleased! It was a bit chaotic to figure out what was going on, but we got our race numbers sorted out and were ready to go. I don’t have much of a warm up- that’s what my first 2kms usually are, so I didn’t stress about that too much. The start was good, I felt a bit unfocused and airy-fairy, but kept relatively on track (probably at a slower pace than I should have in the beginning, but it felt doable and didn’t shock my system!) and then slowly started picking it up. Running up to 6k felt the longest, I think. From 6-7k I really started motoring. From 7-8, I had NOTHING left. Saliva was flying out of my mouth, I couldn’t muster the energy to wipe it haha. All I could think (just before all thoughts left my head- was that I was FREE TO RUN!!!) And then I was just gasping for breath. Finished with a 38:?? Didn’t catch the last bit because I was focused on running so hard! Post-run had great snacks and protein milkshakes. A good and fun atmosphere, makes me really glad I signed up! I’m actually sort of looking forward to my next run in two weeks- a 10k. My ultimate goal is to run an under 50 minute ten kilometres. We’ll see- so far I was on pace for that this weekend. And a special thanks to my husband for actually racing with me, and helping me pace-set. I think it really helped me achieve what I was hoping for this race. Yeah! !